It's one of the highest honours for an academic from West Africa. Wisdom Tettey, Dean of the Faculty of Creative and Critical Studies at UBC's Okanagan campus, has been elected as a Fellow of the Ghana Academy of Arts and Sciences. 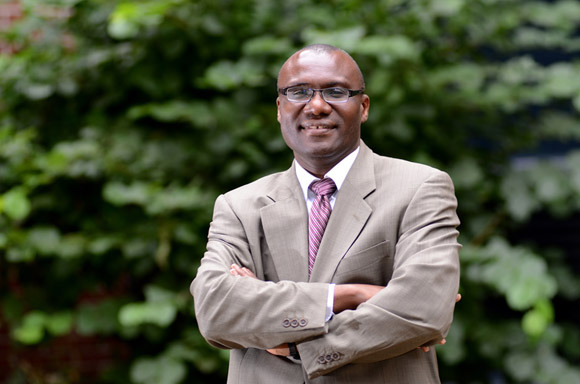 Tettey joined UBC in June 2011 from the University of Calgary, where, for two years, he was Interim Dean of the Faculty of Communication and Culture for two years and later appointed Associate Dean-designate for Interdisciplinarity in the Faculty of Arts. While he has lived in Canada for the past 23 years, Tettey retains strong ties with Ghana and is thrilled with this appointment. Tettey's research covers a wide range of disciplines and his areas of expertise include mass media, political communication, and civic engagement in Africa; the African diaspora and transnational citizenship; information/communication technologies and the political economy of globalization; and international and intercultural communication. He is a recognized international scholar with great accomplishments and he has a broad perspective and wealth of knowledge on many international matters, says UBC Okanagan's Provost and Vice-Principal Wesley Pue. Being awarded a fellowship into the Ghana Academy of Arts and Sciences is indeed an accomplishment to be applauded, he adds. The Ghana Academy of Arts and Sciences was established in 1959 and was officially opened by Prince Philip, Duke of Edinburgh. At that time, it was the first of its kind in Africa and had 20 fellows. The academy currently has a membership of 98 living fellows. Over the years it has become an internationally-renowned independent think tank that uses its platform to raise critical issues that affect all residents of Ghana. Honorary secretary of the Ghana Academy of Arts and Sciences Ralph Mills-Tettey says election into the fellowship is a lengthy process where a candidate must first be nominated and then undergo an extensive review of publications and teaching credentials. Tettey will be officially honoured and welcomed into the Academy's Fellowship during Founders Week, which takes place in Ghana in November.